Equipo Navazos Nights: How Low Dare You Go? For Equipo Navazos fans it’s a numbers game. And in the era of ‘Unicorn Wine’, where there’s a temptation to seek out all things rare, it seems to be a case of ‘the lower the better’. My own low number was 27. That is, until a few weeks ago when I was treated to a selection Equipo Navazos bottles in La Carboná, Jerez. Hidden amongst the showcase of relatively recent releases was La Bota de Manzanilla No. 22. For this saca in May 2010, Equipo Navazos selected 22 butts from a solera of 12 scales in Sanchez Ayala. The criaderas were refreshed on an monthly basis, and the average age of this wine is estimated at six years. While these may have been the determining factors upon release, without tasting the wine at that point in time it’s hard to fully comprehend the role that its subsequent five plus years of bottle age had in bringing the wine to its current juncture. I believe this bottle had been open (and resealed) for a few days prior to my tasting, and, to be quite frank, I have no understanding of whether that time would materially affect such an evolved manzanilla. One thing was very clear in my mind though – the wine still very clearly displayed its Sanluqueno roots. The characteristic pungency was still there, albeit somewhat muted. I imagine the extended time in bottle had impacted greatly on the colour, for it now poured a dullish amber. Some smokey and butterscotch notes were present alongside the expected nuttiness, but the wine’s marine character was still very much to the fore. This was certainly broader than your average manzanilla, and a whole world away from the lively La Bota de Manzanilla No.55 that I tasted alongside it, but the overriding feature of the wine for me was its stunning balance – incisive and intense, focussed and very fine. Every actor in this play was delivering a commanding performance by supporting their co-stars. An effect of the bottle age perhaps? It’s easy to fawn over rarity, particularly in a wine that you want to love. And yes…I loved this sherry, but I admit to having no frame of reference for such evolution. 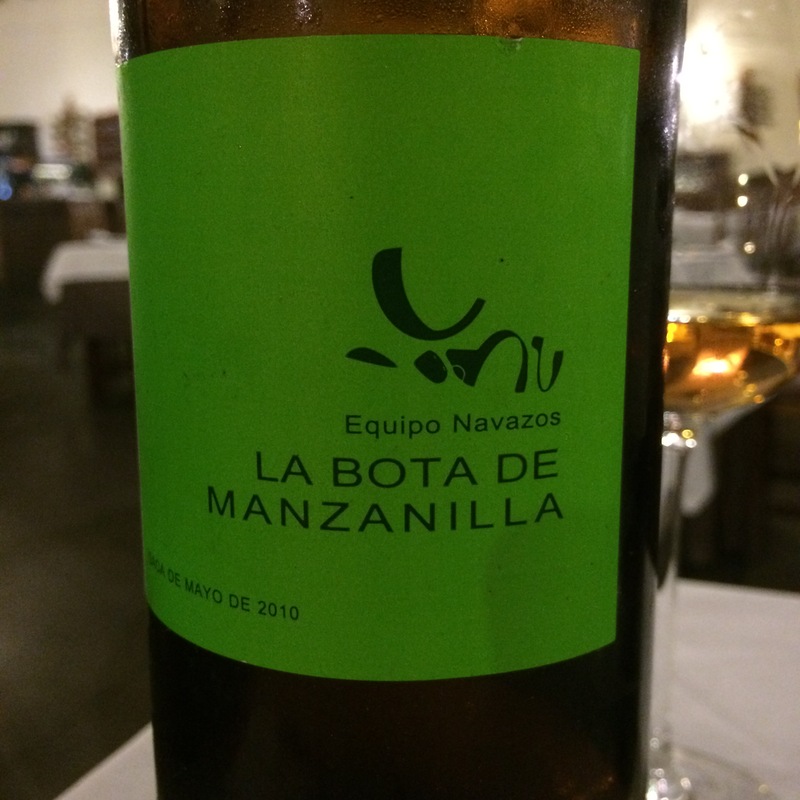 While Equipo Navazos often extol the virtues of bottle development of biologically aged sherries, your chances of finding such older bottles now are limited save for capturing some of the La Bota de Manzanilla No. 32 bottles which were held back from sale until they had reached three years of maturation. The solution of course is to stash more recent releases away in your cellar – the aforementioned La Bota de Manzanilla No. 55 seems like an obvious candidate, although I think it’ll also be really interesting to see what becomes of La Bota de Manzanilla Pasada No. 50 in a few years. Equipo Navazos wines are imported into Ireland by Celtic Whiskey Shop / Wines on the Green. The range is available in their Dawson St. store in Dublin with many releases also available in Black Pig. The UK importer is Alliance Wine.